Round 3 voting for March Mayhem has begun, so get caught up with everything that happened in Round 2 with our review! 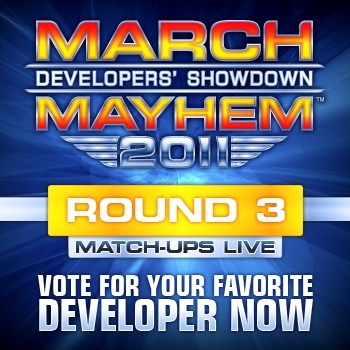 March Mayhem: Developers' Showdown is down to 16 teams and now is when things really start to heat up. Round 2 had some more great match-up wins and even a couple upsets that still have participants in amazement. Blizzard, BioWare and Valve continue their trek towards their Division titles as Rockstar North seems to be picking up speed in the West Division. A couple other great wins came from Bungie as they took down Rocksteady Studios and Epic Games for sending Lionhead Studios packing. Even though the number of developers was cut in half in Round 2, there were still a couple of amazing upsets that will have a huge impact on how the overall brackets will play out. The biggest came from this year's Cinderella studio, Mojang AB who after beating Nintendo in the first round also took out long standing developer Namco Bandai in the second! Is there any stopping Notch and the Minecraft community? Also in Round 2 came another startling upset as Irrational Games, creators of BioShock and the upcoming BioShock Infinite, beat long time developer Konami! It looks as though some people traded in their Konami code for one of those new fancy plasmids. Blizzard has yet to really be challenged this year but Irrational has come out strong in both rounds prior. This could be an upset in the making. Both studios are excellent and have the ability to split the votes right down the middle for their fans. Mojang seems almost unstoppable after taking down Nintendo, but they have yet to meet Epic Games and their fans of the new release Bulletstorm and the Gears of War series. These developers are both huge in their own right with a library full of blockbuster titles. Last year's champ has to go up against one of the strongest communities March Mayhem has ever seen. This is the wildcard of the 3rd round as veteran March Mayhem developer Capcom goes up against newcomer Game Freak. Capcom has a lot of fans around the world but can they overcome the overwhelming obsession of the Pokemon crowd? For those of you who are just joining us in March Mayhem, head over to the Rules Page to see how you can participate and start getting entries towards the amazing Alienware laptops we are giving away! To everyone who had filled out a bracket, make sure to check out our brand new Leaderboard to see where you stack every round! Round 3 has begun, so head over to the Official Bracket to begin voting. Welcome to the Mayhem!